PERU – Dr. Moises Ronald Vázquez Caicedo Ayras, president of the Universidad Nacional del Centro del Peru (UNCP) and Douglas Morrison, president and CEO of the Centre for Excellence in Mining Innovation (CEMI) are taking the first steps in developing a partnership to advance mining innovation in technology and knowledge transfer, demonstration projects, as well as skills development for students, faculty and professionals. They signed a memorandum of understanding on Feb. 1, 2019. 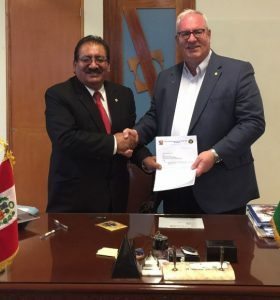 Together the UNCP and CEMI will promote Canadian technical capabilities and Peruvian mining opportunities with the goal of creating more business opportunities in both countries. Combining the university’s research strength and the association’s technical and commercial expertise in innovation is anticipated. “We believe that managed and purposeful collaboration between our two organizations is the best way to maximize and accelerate the technical changes that the global mining industry must make to become ‘fit for purpose’ in delivering the mineral products for the global industrial economy while meeting the social and environmental demands of a globally sustainable society,” CEMI said in a news release. CEMI is headquartered in Sudbury, Ont. Visit the website at www.CEMI.ca.